Yoga is a personal connection between your body, mind and your spiritual aspects. It is where you integrate the sum of your life's experience and make it your own. In turn, you can use the tools and knowledge you gain from yoga in your daily life. 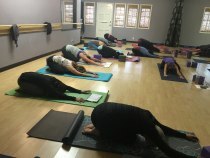 Our Yoga classes in La Habra, CA follow a basic Hatha flow with sequencing that will help relieve any imbalances you may be experiencing physically or mentally. It is important to remember and to embrace that we are all unique and have different abilities and strengths. Because of this our instructors will challenge you but always encourage you to listen to your body and to honor where you're at. Our yoga classes are done in a non-intimidating environment and cater to all levels. Our "Healthy Back Yoga" will include physical therapy exercises to help strengthen your back and restorative yoga poses to help relax and stretch your spine. Call us at (562) 905-3434 for scheduling and to sign up for a yoga class.